Interested in learning more about Funtagious? Call (978) 649-4FUN for more information about our facility, or to book your party or group function. Welcome to Funtagious Fun Center. Voted "Best Family Fun Spot" Lowell Sun "Best of" Poll! 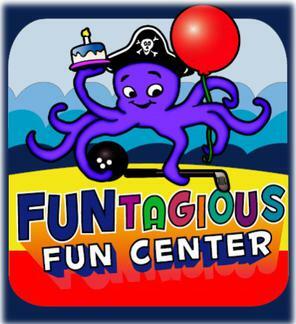 Funtagious is the ultimate fun center for families and groups of all ages to get together and have an outrageously fun time. Whether you're age 6 or age 86, if you are looking to have a great time, you will find a multitude of fun and exciting things to do. No matter if you're with family, with friends, or part of a group, our facility can accommodate both public or private events. Walk-ins are welcome during normal business hours, but reservations are required for Birthday Parties and Private Events. With over 15,000 square feet of climate controlled area, Funtagious offers the area's largest variety of world class indoor attractions, arcade, and table games. Since Funtagious is an indoor facility, you don't have to worry about the weather spoiling your fun! We feature "Shankz" Black Light Minature Golf, 4 lanes of "Highway 66" automatic mini bowling, "Balladium" ball blaster arena, "Time Freak" time challenge arena, Billiards, Arcade, and Kiddie Rides; along with Private Party Rooms, Private Game Room, and Private Function Hall.There's fun for everyone. Our facility was developed to offer our guests a high quality, clean, and safe environment for their entertainment pleasure. Funtagious. It's contagious. "Catch the Fun!"